BOWIE, Md. (WUSA9) -- An arrest has been made in connection with a shooting that happened at the Huntington Community Center in Bowie Tuesday evening, police said. Christopher Carl King, Jr., 20, of Bowie was arrested Saturday, police said. Maryland National Capital Park Police and Prince George's County police obtained an arrest warrant for King. He is wanted in connection with the shooting that happened Tuesday evening and left a 23-year-old man injured. HYATTSVILLE, Md. (WUSA9) -- A Hyattsville man was arrested on first degree assault charges for striking a woman in the face several times in Bowie back in May. The incident happened on May 24 in the 3000 block of Northview Drive in Bowie, Prince George's County Sheriff's Office said. Andre Madison of Hyattsville, Md. was arrested on a warrant for first degree assault. Officials say Madison and the woman got into an argument which then turned physical. Madison hit the woman in the face several times and then fled the area. Deputies found Madison on June 11 in the 6000 block of W. Forest Road in Hyattsville. He was taken into custody without any issues. BOWIE, Md. (WUSA9) -- A 23-year-old man is in stable condition after he was shot multiple times Tuesday evening at a community center in Bowie, Md. According to Maryland National Capital Park police, the shooting happened at around 5:45 p.m. on the ground of the Huntington Community Center. The man was shot multiple times and driven to the Doctors Community Hospital by friends or other associates. The people who drove him left before the police arrived. Police later identified the suspect as Melvin Avon Thomas Jr. of Bowie. He has been transferred to MedStar Washington Hospital Center where he is in stable condition. A person of interest has been identified in connection to the shooting, but police say no arrests have been made. The center, which is on the 13000 block of 8th Street, is on Maryland National Capital Park land. GREENBELT, Md. (WUSA9) -- A Temple Hills man was found guilty in federal court Tuesday of an armed robbery at a Pizza Hut in Bowie, Md. Gary Hancock Jr., 37, was convicted of robbery, brandishing a firearm during the robbery and being a felon in possession of a gun and ammunition in connection to the May 2013 robbery. According to federal prosecutors, Hancock robbed the Pizza Hut on the 1200 block of Crain Highway in Bowie. They say he entered the store, pointed a handgun at an employee and demanded a safe be opened. When the employee said he could not open the safe, prosecutors say Hancock demanded money from the cash register. The employee gave him the money and Hancock fled the store on a motorcycle. BOWIE, Md. 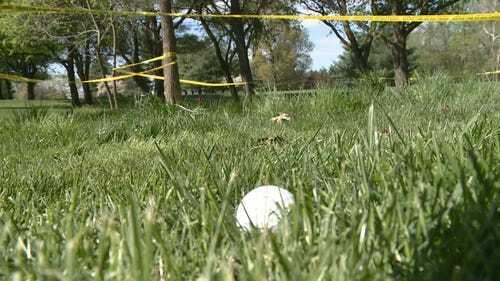 (WUSA9) -- Police are investigating after a body was found inside of a burning car at the Enterprise Golf Course in Bowie on Sunday. The golf course is located at 2802 Enterprise Road. Police say a grounds keep came to work around 5 a.m. and saw a car in flames close to the 9th hole. BOWIE, Md. (WUSA9) -- Police are searching for two suspects in connection with an armed robbery at a Bank of America in Bowie Tuesday morning. The robbery happened at the bank located at 6911 Laurel Bowie Road around 9:30 a.m., according to the FBI. Both of the suspects were armed and threatened the bank employees. They also demanded money, according to authorities. Nobody was hurt.